McCaela Donovan (center) with her sister Muses. All Photos: Craig Bailey/Perspective Photo. 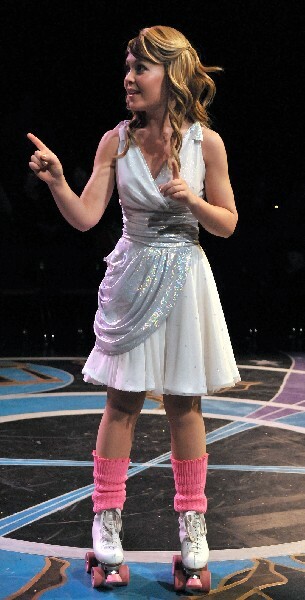 McCaela Donovan as the muse Clio in a scene from the SpeakEasy Stage Company production of Xanadu. 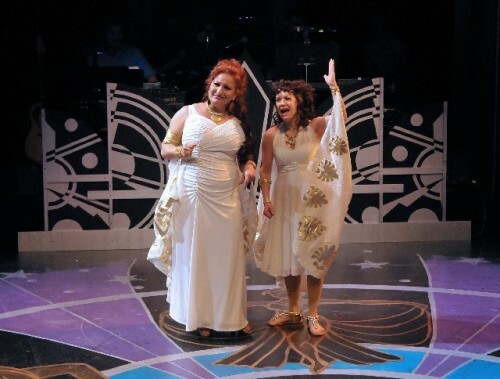 Shana Dirik and Kathy St. George in a scene from the SpeakEasy Stage Company production of Xanadu. Rarely does a show start you off smiling and continues to keep you smiling and laughing throughout its length. 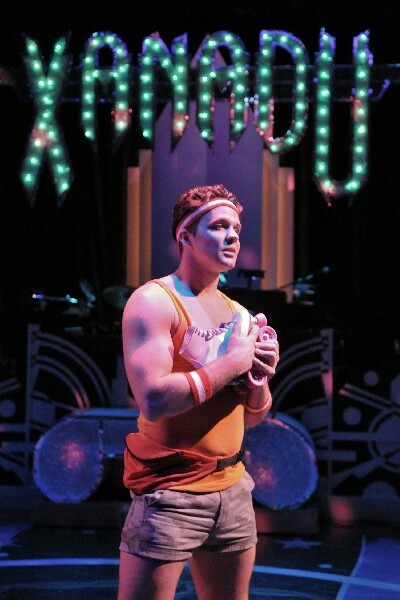 Xanadu at the SpeakEasy Theatre Company is this rare avis. With a cast of talented performers, an extremely funny storyline and a clever set, this wonderful witty campy production is nothing less than an entertaining big hit. Somehow Cooleridge's Romantic Poem is the basis for the theme of the show. 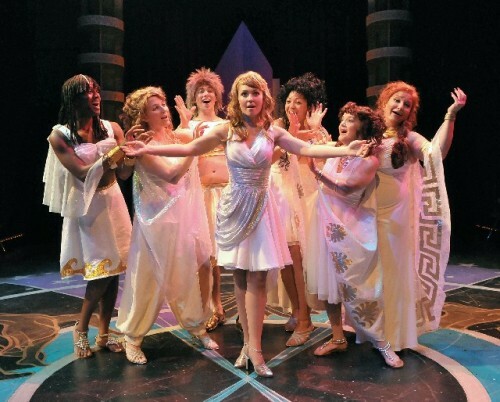 Mix together a struggling artist with dreams of stardom, Ancient Greek mythological muses, a ruthless real estate developer, a roller disco, unfulfilled dreams, a jealous curse, Medusa, Pegasus, a Saytr, a Cyclops, Zeus, Aphrodite, a '40s singing trio and a lot of campy fun and you get Xanadu. It all starts from a badly drawn street mural of muses. Xanadu defines the term "campy." As the Urban Dictionary says, "Camp" n. or "Campy" adj. refers to intentionally exaggerated thematic or genre elements. “Camp” style willfully over-emphasizes certain elements of the genre or theme, creating an almost self-satirical milieu. At the SpeakEasy, Xanadu is like Mama Mia meets Clash of the Titans on roller skates. It sends up the 1980 Olivia Newton-John cult film that the 2007 show is based on (this is the Boston Premiere), art of the 1980s, Gay culture, theatrical artifice, and the show itself. By the way, the Newton-John film is considered one of the worst ever made. Set in a derelict theatre once called Xanadu in Venice Beach, CA., the fantasy storyline goes in and out of a 1980 not so reality to Greek Mythology and even 1940s period musicmaking. Miraculously at the end of the story, the theatre is revived into a roller disco and everything comes together just fine. The show's performers are all very talented. They are a wonderfully entertaining ensemble who were often asked to vogue and camp it up. Notable is McCaela Donovan who plays Clio/Kira, the roles played in the original movie by Ms. Newton-John. Her excellent voice, roller skating and stage presence are wonderful. 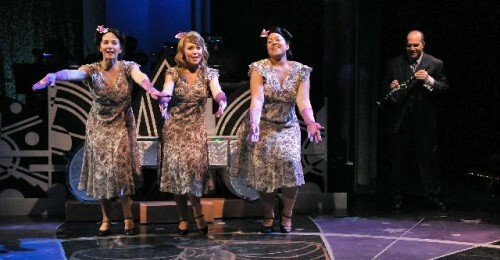 She was terrific as well in last year's Drowsy Chaperone at the SpeakEasy. Standout performances were by three others. Shana Diri (Melpomene/Medusa), Robert Saoud (Danny) and Kathy St. George (Calliope/Aphrodite). Either in movement, song or theatrical schtick, everytime Ms. Dirik and Ms. St. George were on stage something wonderful and special was taking place. Diminitive St. George literally gnawed on the scenery at one point while the voluptuous Dirik bumped and grinded to real or imagined torch songs. Mr.Saoud did it all. He sang, danced and skated. All entertaingly skillful. He makes it look easy as well. All three actors seemed to greatly enjoy what they were doing. The audience did as well. Though gifted with a nice voice, the least effective performer was Ryan Overberg as Sonny, the ersatz artist/hero. Sadly he was dressed as a young Richard Simmons, the Sweating to the Oldies Queen but on steroids. Good-looking and muscular, the very gay apparel just didn't work for a macho supposedly heterosexual Sonny, and Overberg's delivery needs to develop a change-up and maybe a cutter fastball, or rather nuance and modulation. The set and the props were cleverly created. Two notable elements were the Pegasus and the Phone Booth. However, a minor weakness is that the actual disco light ball was too subtle. Perhaps, this was not to compete with the often over the top performances? Oh well, we still love the night life, and we love to boogie! Overall, this is an entertaining piece of kitsch raised high to entertaining silliness and fun. It proves emphatically that disco and rollerblading still live in our hearts. The often sassy and witty fantasy story is about playing for audience reaction and laughs. The performers get it, and the audience gets it. This hit show should attract a big happy following. Xanadu is a joyous 90 minutes of smiles.